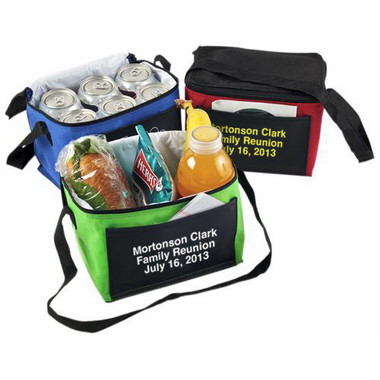 Your guests will enjoy taking this party favor to lunches and picnics. It can hold everything from sports drinks to baby gear. This cooler neatly fits any standard 12 oz six pack. It measures 8" x 6" x 5 1/2" and has a 25" carry strap. Three colors are available, each with a black top and bottom, and a vinyl pocket with your imprint of choice. 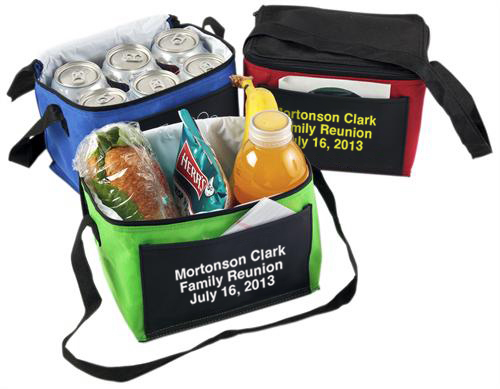 You can personalize the cooler with a message of your choice. The imprint covers an area of 4" x 2". A one time personalization /art imprint fee of $35 will be added to your total. Please allow approximately 10 days for production time.